If you're looking for a way to lose billions of dollars, blow up a lot of expensive hardware and possibly even kill people in the bargain, you couldn't pick a better field than rocketry. There's a reason only governments have space programs, and that's because they've got the cash to burn and the time to waste and nobody's asking them where the profits went. That, at least, is how things were  but it's surely not how they are anymore. On May 31, the brand new Dragon spacecraft splashed down in the Pacific after a nine-day mission during which it flew to orbit, rendezvoused with the International Space Station, exchanged cargo and then made its way home without incident. It wasn't NASA that built the ship and it wasn't Russia or China or the European Space Agency either. It was Elon Musk, private citizen, owner of the California-based Space Exploration Technologies Corporation (SpaceX), and the current best bet to get Americans back into space in a big way  first to orbit and then maybe beyond. 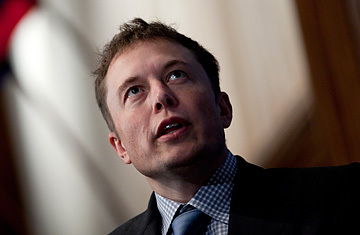 Musk, 41, is a native South African and the inventor of what was once a little-known e-commerce service called PayPal. PayPal made him a rich man, and in 2002, he rolled part of that fortune into a new company designed to reinvent the rocketry field  building simpler, more streamlined boosters to provide for-profit satellite launching services, as well as an Apollo-like spacecraft (which he dubbed Dragon, as an homage to the magical Puff), that could accommodate up to seven people. In the past decade, the fever-dream of having your own little space program has not been all that uncommon  at least if you're very, very rich. What buying a sports team once was to the .0001%, going to space  and charging to take other people here  has become for the likes of Paul Allen, Richard Branson and others. But Musk's plan was different. He wasn't interested in marketing suborbital joyrides to people who could afford $250,000 for a 20-minute flight. He wanted to build real real-live rockets and real-live spacecraft, for the purpose of doing long-term work in real-live space. And as it turned out, NASA actually needed the help. In 2004, the George W. Bush Administration announced that the shuttles would be retired by 2010 and that NASA would have to come up with a new way to get Americans to space. In 2006, with work on a new booster underfunded and behind schedule, the space agency decided to throw the doors open to the private sector, accepting bids from companies that wanted become the country's taxi service to low-Earth orbit. SpaceX and a Virginia-based company called Orbital Sciences made the cut, and both are now under contract to make at least 12 resupply trips to the ISS from 2012 to 2015, with more flights to come  perhaps carrying astronauts  if NASA likes what it sees. NASA had to like what it saw in May, when Dragon performed so flawlessly, and SpaceX is now the it company in the aerospace community (though Orbital Sciences still has its own flight planned for later this year). Musk has already inked billions of dollars worth of deals with both the public and private sectors and is proceeding apace with his eventual plans to fly people (including non-NASA crews) to orbit, to the moon, maybe to Mars. The success  so far  of SpaceX is due as much to the perfect convergence of government, industry and history as to the singular personality of Musk himself. He is equal parts Gates and Jobs, engineer and visionary, industrialist and, yes, egotist. "In terms of things that are actually launching," he says, "We are the American space program." The thing is, he's kind of right. Read the full story in this week's issue of TIME, available to subscribers here.